Vast valleys sculpted by the Chacabuco River form a natural corridor that, since ancient times, has been used for travel both by nomadic peoples and a large diversity of fauna. Once the site of big cattle ranches, today the grasslands have begun to recover after a century of overgrazing and are now home to one of the highest levels of biodiversity in the Aysén region. This is Patagonian steppe in all its splendor––mountain ranges, Lenga and Ñirre forests that burst with red in fall, active wildlife, and dozens of spectacular lagoons and lakes, such as Cochrane and Jeinimeni, which nourish these landscapes of overwhelming beauty. All this helps to tell the story of one of the most important ecosystem restoration projects in the country. Drive the scenic Route X-83 toward Roballos Pass. Hike the Lagunas Altas Trail in the Chacabuco Valley. Take in the vastness of Lake Cochrane from the Douglas Tompkins Lookout Point or from one of the Tamango trails. Visit the confluence of the Baker River––the river with the largest water volume in Chile––and the Chacabuco River. Cross the 330-foot-long footbridge over the Chacabuco River and the footbridge found in the Avilés Valley. Birdwatch at the various lagoons in the Chacabuco Valley. Walk through the Lenga forests in fall. Take a boat along the Cochrane River. Visit the “Piedra Clavada,” a 130-foot-tall volcanic rock formation, and the Moon Valley in Jeinimeni (Route X-753, mile 15/kilometer 25). Dry, spiky Coirón dominates the grasslands, while the Lenga and Ñirre forests showcase their bright red leaves in fall. In springtime, Neneos flower, turning the parklands a pleasant orange. Endemic species include Chauras, Calafates (Magellan Barberry), Notros, Zarzaparrillas, and various endemic Orchids, such as the Porcelain Orchid. Many other species of flora can also be found in the park. With herds of Guanacos in the grasslands and Condors roaming high above, Patagonia Park’s varied ecosystems make it a wildlife paradise. Ten percent of the remaining population of Huemules (South Andean Deer) in Chile live in the park, alongside Pumas, Southern Viscachas, Ñandús, Armadillos, and Foxes. The park’s birds include Flamingos, Pitíos (Chilean Flickers), Carpinterito Woodpeckers, and Loicas (Long-Tailed Meadowlarks). The Aonikenks, or Tehuelche people, were nomads who traveled the Patagonia by foot. They were expert hunters and used spears and bow and arrow to hunt Guanacos and Ostriches. There are more than 100 archeological sites in the Chacabuco Valley, including one that shows traces of human activity dating back 7,700 years, near the Baker entrance to the park. In Jeinimeni, there are also caves with paintings and other signs of early human occupation. Patagonia National Park is located approximately 196 miles south of Coyhaique along the Carretera Austral. Eleven miles before arriving to Cochrane, you’ll come to the crossing that will take you to the Baker entrance. Turn left to follow this road east for 7 miles, until you arrive at the park offices. If you wish to visit the Tamango sector, drive to Cochrane. From the Plaza de Armas (Cochrane’s town square), travel northwest 2.7 miles. To reach the Jeinimeni sector, drive toward Chile Chico. From there, take Route X-753 (the same road that leads to the aerodrome) for around 40 miles, until you reach Lake Jeinimeni. Various public transport options are available, traveling daily from Coyhaique to Cochrane (Don Carlos, Águilas Patagónicas, Sao Pablo). There are also routes from Coyhaique or Cochrane to Chile Chico (Buses Aldea). You can find more information about schedules in Coyhaique. From Coyhaique, travel to Puerto Ibáñez, where you can take the ferry crossing Lake General Carrera to Chile Chico. Chile Chico is 40 miles from the Jeinimeni sector, 107 miles from the Chacabuco Valley, and 111 miles from Cochrane. If you’re coming from the south, you can take the ferry from Puerto Natales to Puerto Yungay. From there, drive 82 miles north on the Carretera Austral to reach Cochrane. From Argentina, we suggest crossing the border at Los Antiguos/Chile Chico to reach the Jeinimeni sector of the park, or at Roballos Pass to visit the Chacabuco Valley or Tamango. Sky and LATAM airlines offer daily flights to Balmaceda, 34 miles south of Coyhaique. At Balmaceda, car rentals and buses are available. The Carretera Austral is 7.5 miles west of the airport. A beautiful trail with a steep descent to the confluence of the Baker and Chacabuco Rivers. A relatively easy walk that begins beside an organic garden and ends at the Los West Winds campsite, the campsite nearest the park offices. A hike that begins alongside a lagoon and later crosses the pampa in the direction of the Chacabuco River, offering excellent views of the Southern Icefields. This hike begins in the Avilés Valley, which connects to the Jeinimeni sector of the park, going up the river on the right, then crossing the Avilés footbridge and returning along the opposite shore. From the Alto Valley Campsite, take the road 4.3 miles to reach the beginning of this hike, which offers spectacular views of Lago Cochrane and the San Lorenzo peak. The hike begins 1,000 feet from the campsite and follows the Cochrane River until reaching the lake. Part of the circuit joins up with other trails: Los Coigües, Ñirres, Huemules, and Las Águilas. The eastward continuation of the Los Carpinteros Trail, later connecting to the Los Ñirres Trail. A trail that connects the Los Carpinteros and Huemules Trails as part of a larger circuit. This trail is part of a circuit that connects the Carpinteros and Ñirre Trails. This trail begins at the Tamango entrance and ascends between the Tamango and Húngaro peaks before coming to a bifurcation, where you can head left to connect to the Los Carpinteros Trail or right to the Los Huemules Trail. This trail is part of a circuit that reaches Laguna Cangrejo, at the end of the Las Águilas Trail and the beginning of the Huemules Trail. The altitude change is 1,821 feet. This hike begins at Laguna Cangrejo, brings you to Laguna Elefantita, and ends in the valley. This trail is the continuation of the Los Valles and Huemules Trails and part of the circuit that ascends to a spectacular view of Lake Cochrane. 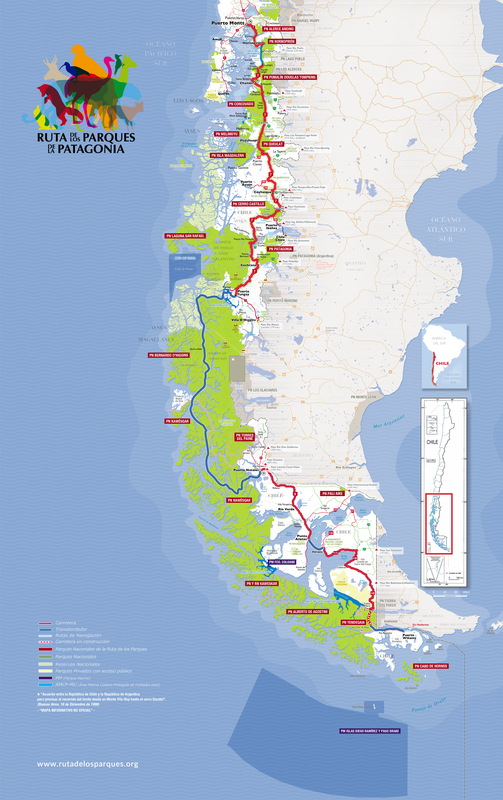 This trail begins at the end of the Las Lengas Trail and leads to the Patagonia Park offices. Take a left at the bifurcation and follow the trail around the lagoon. A circuit hike that reaches a 130-foot-tall volcanic rock formation, visits a small, rocky cave where you can see vestiges of the Tehuelche people’s life here, and finally ends in the beautiful Moon Valley. Starting Point: Route X-753, mile 15/kilometer 25, Jeinimeni. Starting Point: El Silencio Campsite, Jeinimeni. This trail begins 2 miles from the El Silencio campsite and ascends a hillside, offering panoramic views of Lake Jeinimeni. This trail begins at the Conaf offices, passes through the campsite, crosses a bridge, and runs along the shores Lake Jeinimeni, before finally reaching the lagoon. This circuit hike is a highlight of the park, particularly in fall. Be careful with the river crossings; wading can be necessary at times, and water depths change rapidly due to rain and thawing ice. Finishing Point: Casa de Piedra Campsite. Also known as the Huemul’s Route, this circuit connects Tamango and the Chacabuco Valley. The local community hikes this route twice a year. Starting PointTamango or Los West Winds Campsite. Finishing Point: Los West Winds Campsite or Tamango. There are three campsite areas in Chacabuco Valley (Los West Winds, Casa Piedra, and Alto Valley), open from October to April. Reservations cannot be made in advance. The cost is $8,000 CLP per person per night. In Jeinimeni, the campsites cost $10,000 CLP per campsite per night. It costs $5,000 CLP to rent a picnic area. The entrance fee for the Tamango and Jeinimeni sectors of the park is $2,000 CLP for Chileans and $3,000 CLP for foreigners. There are two lodges at the park offices, which must be reserved in advance reservas@vallechacabuco.cl), as well as a restaurant, which is open from October to April. There is no cell service in Chacabuco Valley; however, there is cell service in Cochrane and Chile Chico. Cochrane is located 17 miles from the park offices. There, you can find additional options for food and lodging, along with a gas station and an ATM. Chile Chico is located 40 miles from the Jeinimeni sector of the park. There, you can also find additional options for food and lodging, along with a gas station and an ATM. A lake port with a car ferry across Lake General Carrera to Chile Chico. Located on the southwestern shore of Lake General Carrera, 186 miles from Coyhaique and 71 miles from Chile Chico. Very close to the border with Argentina, on the shores of Lake General Carrera, this town has a microclimate that allows for the cultivation of fruit normally grown in central Chile, such as cherries. The Baker River, which has the largest volume of water of any river in Chile, flows from Lake Bertrand alongside Puerto Bertrand, a village offering rafting and fly-fishing options on the river. Founded in 1954, this town is 205 miles south of Coyhaique, on the shores of the Baker and Cochrane Rivers, near Lake Cochrane and close to San Lorenzo peak and Parque Nacional Patagonia.